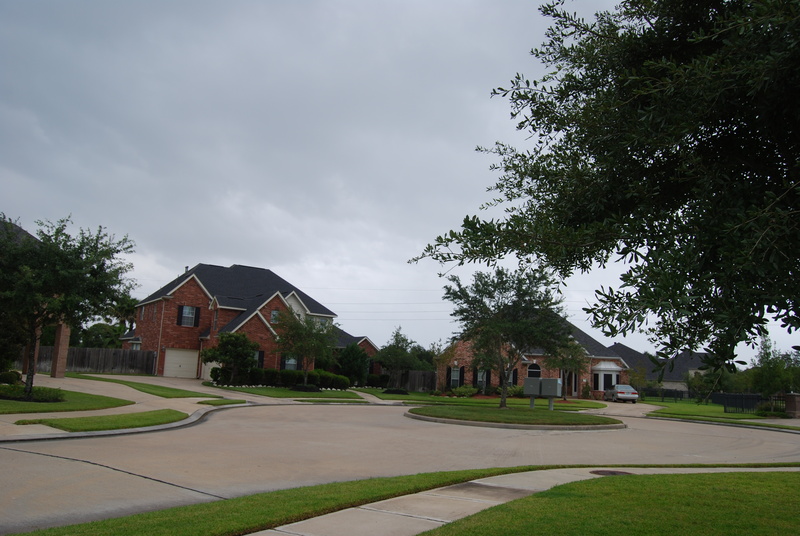 All is still fairly calm here in Katy, TX – a large suburb located about 20 miles west of Houston city center. We have experienced a few gusts that shook the trees but nothing yet that hints at the fury that Ike will most likely bring to our area. Several of my neighbors are trying to decide who will have the Hurricane Party. Meanwhile, I have cleared out the large closet under my spiral stairway as our safe room should we need to get away from breaking glass and other dangers. It was very interesting getting my kids involved in clearing out the luggage, out-of-season clothing and Christmas decorations to make room for our family of five (myself, hubby, two kids and pet). The boys (twin 17 year olds and scientific minded) could not quite grasp the necessity of having to go into this cramped space for safety, much less having to stock it with food, water, blankets, pillows in the event we get trapped there for a pro-longed period of time. In retrospect, growing up in the Panhandle area of Texas, we were instructed by our schools on what to do in the event of a tornado. And again, when I moved to the Mississippi Gulf Coast and to New Orleans, I received further instruction on what to do in the event of a hurricane. I do not think my kids (having grown up in Dubai, UAE and Katy, TX) have been given the slightest hint at how to survive a natural disaster. This is something we parents should act on – but not today. At this time, I feel we are as prepared as we can be. My safe room is ready and I hope that after the storm, my kids can look at me and say, “I told you so, Mom!”. Nothing would give me greater pleasure. But as a former Cub Scouts Den Leader, I am always prepared. More photos to come as the weather changes. For now, sun is peeking in and out of clouds, light breeze with occasional gusts and a little sprinkle now and then . Otherwise, things are pretty darned calm in Katy, TX. This entry was posted on Friday, September 12th, 2008 at 9:01 pm and is filed under Community News, Hurrican Updates, Uncategorized. You can follow any responses to this entry through the RSS 2.0 feed. You can leave a response, or trackback from your own site. We’re in Pasadena. Lost our power at 2:45 pm. Centerpoint got it turned back on about 15 minutes ago. I’m learning about ‘perspective’ and preparedness through the eyes of my daughters (ages 5 and 15). The youngest, Emma, was watching TV upstairs when the power went out. She wasn’t as concerned about why the power went out as she was that she couldn’t watch Noggin any more. She opened our back door to go outside to play…and walked straight in to our plywood cover. You should have seen the look on her face. She is so confused about all the preparations. The 15 year old might need Benadryl laced peanut butter to settle her down before this is all over. I remember that Alicia hit our area when I was her age…I don’t remember getting this worked up over it. What I do remember is my older sister getting to drink a sip of mom’s “toddy” so she would settle down. Anyway, your sons may not have natural disaster perspective…but they have perspective of the world (concerning where they’ve grown up) that many of our children may never have. Learning to survive natural disasters will come in the form of direction instruction by you at a later time. The other experiences they must have had are priceless. Good luck today and tomorrow. God bless. Thank you for your response. I wonder what happened for you to lose your power so soon? Yes, our kids will learn a very valuable lesson through all of this. Funny, when we evacuated during Rita, they complained that they had to leave their friends and there was nothing to do in Austin… blah, blah, blah:). Now, they have finally figured out we may lose power for an extended period of time, they are complaining about staying in Katy. You just cannot win with teenagers:). Yes, my kids have had a lot of interesting and wonderful experiences. Unfortunately, most of them were when they were toddlers and only remembered when viewing photographs. Good luck to you and your family and God bless you, too! Thank you so much for this blog. I live in Austin and my sister has decided to stay in Katy to ride out the storm. She is pregnant and is about 2 weeks away from her due date, so I am very concerned. I will be checking in frequently for updates. Thanks again. I will keep up my posts as long as I am able to get online. For your peace of mind, one of the wonderful things about Katy is we have terrific medical services available in the event your sister needs assistance. Let me know if I can help her and I appreciate your checking in. Take care and keep us in your thoughts and prayers. pls keep us posted as much as you can. I have family riding out the storm in Katy and no longer can get through to talk to them. God bless and thanks for the post. Thank you so much for keeping your blog going. We have been glued to the TV watching and wondering how everyone back home is doing. Our prayers are with everyone who stuck it out. Please let us know how you everything is going in the morning as we are extremely concerned about everyone back at home. I am glad I ran into this site. I live in Washington State and my neice who has never seen anything worse than snow is living in Katy now. Convinced her finally that going to stay with people in a mobile home was not a good idea so she left her 3rd floor apartment to stay with friends in a 1 level house.. hope that works well! So you and yours stay safe and dry and I hope it cools off for you and I will check in here for any updates you are able to leave. Thank you so much for this blog as I have difficulty getting information about the current situation in Katy. I am from Brunei, half way across the world and I have a sister, brother-in-law and two beautiful nieces living in Katy. We are pretty worried and it’s wonderful that you are keeping everyone posted of events. Do keep up the blog if possible. God bless and stay safe!! Any update? Curious on how the street weathered the storm. We evacuated to Austin, but I plan on coming back on Sunday morning. Kelly and the kids will stay in Austin for a while. Thank you for your blogs, just wondering how is katy now? seems you are the only link in that part of town who is providing information. Nice to know that your community did not get hit by IKE. I have a friend that lives there and I have been quite concerned about him. I’m so happy to hear that your community did not get hit by Ike. I have a friend there and I have been quite concered about him. Daughter lives on Bridge Falls Ct. Have not heard from her nor do our calls go through. Just need to be reassured. I am glad to see that all is well in Katy. I have family there and they stayed behind. I hope everything is still fine where you. Thanks for keeping us updated. My prayers are with everyone affected by Hurricane Ike in Texas and Louisiana. I used to live in Plantation Lakes subdivision and my old boss and his family lives in Barker village subdivision in Katy Texas. I am living in Salem, Oregon and I haven’t heard anything from anyone in those areas and worried about old neighbors… so if anyone knows the condition there please leave a message here I will appreciate it. i live in settlers village on little york and fry…..the neighborhood looks horrible. many homes in the neighborhooh are 30 yrs old and most of them held up well. but my neighbors house is trashed. they lost their roof and the roof caved in. they lost everything. their trampoline was picked up and thrown in the house next doors yard. almost taking the house out. many peoples houses in the neighborhood roofs caved in. they still have no power at this time. i just hope everyone was ok.
How about an update on Katy? My son and family had minimal damage, but are staying with friends nearby who have power. When will the power be turned on? I am in Herrritage Park subdivision, and mom and I are using c-pap machines.We finally got power back so that, we were able to breathe with machines at night.My questions are how do we get on a list for help when power goes out in future? I work with Christi and was lucky enough to get a phone call through to her. She wanted me to share that although Katy faired better than most of the Houston burbs, there are still many neighbors without power. Christi is one of those without power her family is safe, but has no way to communicate. Stong winds did damage to many roofs and trees in the Katy area. This was random so one neighbor is undamaged and the next may have a tree on their home. I have had an opportunity to talk to friends in Cinco Ranch, Grand Lakes and Grayson Lakes. I believe most of Grayson Lakes currently has power back on. Cinco and Grand Lakes are both hit and miss with large areas with no power. If you are trying to reach someone in these areas understand they may be uncomfortable, but most are safe. I live in Cyfair area and they have just cancelled school for the remainder of the week. Yesterday I was lucky enough to have a crew I work with often come to my home and secure three damaged areas on my roof. I referred them to several other friends yesterday and I know they are pretty booked up with work, however, I want to share their contact information with Michelle McCance in the hope they can help you in the next few days. Michelle call Dock Chavis @832-888-1726 this is his cell. If he does not answer leave a detailed message and let him know that Tracy and Christi from Prudential Gary Greene, Realtors gave you the number. He will get back to you as soon as he is able. ….I know how hard it is to find reputable help in times like these and sometimes it is worth the wait to make sure you work with someone reliable. I am so glad that Christi took the time to start this blog so that we can share information during this communication challenged time. Christi you are the best!